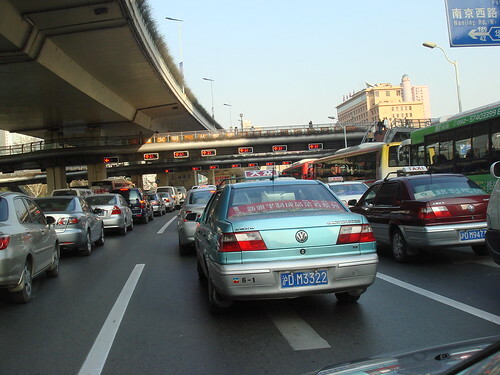 I took this picture today at the intersection of Yan-An Road, and the Huashan Road. If you count carefully enough, you will see 14 red lights in the picture. There are 7 lanes for single direction. Isn’t look funny? Here are the Google Map of the area. When I read your article title, I was sure you was speaking about the special “massage” place and the special “hair cutter” shop… in other word prostitution. Which are numerous in China. Am I a colorful wolf ? Redflag, you’re a creative :) JS, is a photographer. He includes visual information in his dairy/blog too. Take a closer look at the picture. Ao this is shanghai. What a lovely city! 7 lanes in both direction doesn’t seem to have any postive effect on this life-costing bumper-to-bumper nightmare. My previous message has been deleted. Is censorship the new policy of this blog ? Sorry, my previous message as not been deleted. My computer did not load all the pages, I did not saw my previous message. 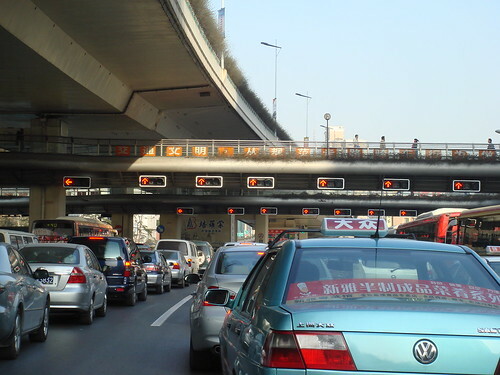 I am looking for a online map that shows the Shanghai expressways, especially southern A30, A4 and A5 in the direction of Zhenjiang province.